First Line: "I'm so sorry," she whispered, as she struggled to close the lid of the wooden trunk. Picker and private investigator Jane Wheel is well and truly in transition. Officially divorced, she's faced the fact that she must sell her house-- and to do that, her realtor has made her see that all those antiques and collections must be packed up and taken elsewhere. Rootless for the first time in years, Jane goes home to Kankakee, Illinois, only to find the entire town in an uproar. A little-known comedian who calls himself Lucky Miller is in town, staging a so-called comeback. It's all part of his plan to break into the big time. Deeply suspicious of the man and all the money he seems to be throwing around, Jane's mother Nellie hires her to investigate Lucky. Wondering why she gives a hoot, Lucky also goes to Jane to find out what Nellie's up to. In the midst of all this snoop and counter-snoop, one of Lucky's crew members dies, hours after claiming that the comedian tried to kill him. What on earth is going on, and why is it happening in Kankakee? Sharon Fiffer's Jane Wheel mystery series has been a favorite of mine since the first book. Fiffer has a way of describing collectibles and antiques that makes me want to hop in the Jeep and head for the nearest estate sale. After drastically downsizing my own hoards, I always enjoy getting a collections fix through Jane. It also doesn't hurt that I'm familiar with the Kankakee area, and the books make me feel as if I've gone back to the old homestead. Being a witness to Jane's packing up years of collections was painful, and I was shocked that she seemed to take it so well. I should have known that the author had a few surprises up her sleeve. 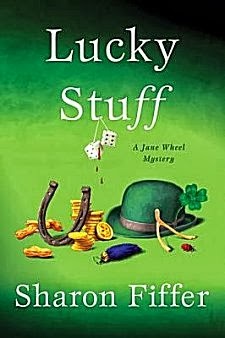 It is a testament to Fiffer's talent that I worried about Jane's stuff throughout the book, even though the mystery surrounding Lucky Miller is a true puzzler. For once, Jane is flying almost completely solo on an investigation. Her partner, Bruce Oh, makes very few appearances, and even her best friend Tim is busy with other commitments. No, Jane is working alone and has the most contact with her parents. Since her relationship with her prickly, no-nonsense mother, Nellie, has always been problematic, this enforced closeness adds yet another layer of interest to this book. A Jane Wheel mystery is always a three-pronged pleasure for its mystery, its collectibles, and its wonderful cast of characters. Lucky Stuff is no exception, and now I find myself in the unenviable position of waiting for Jane's next adventure. Cathy - I know what you mean about enjoying antiques and collectibles. I'm not a collector myself, but I do admire people who really know their stuff when it comes to that business. Sounds like a good read. My grandparents were collectors, Margot, so I grew up learning an appreciation of beautiful, old things. Kankakee, eh? Last time we were there it was for boat races on the river. This does sound like a fun read. I love the entire series, Barbara.